I’m very glad to be joining the sessions of a great event at Kadir Has University in Istanbul. 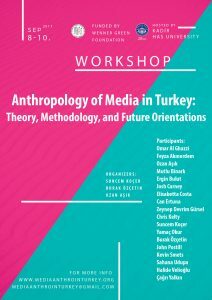 Coinciding with my first days of fieldwork here in the city, the workshop has brought together a number of scholars whose work is very important to my own investigations of social media in the Turkish context and theorizations of what digital media do in society. The workshop sessions have contained a great abundance of exchange, primarily about practical methodological experiences and approaches of doing ethnographic research in Turkey. In particular, John Postill’s challenge to media anthropologists to investigate the specific societal changes (in the plural) that digital technologies bring about, as a opposed to societal change, which is more amorphous and difficult to link to the role of particular technologies, was memorable. It made me wonder how useful such an approach could potentially be for thinking about the way my respondents use social media platforms to create emotional connections to spaces within the city of Istanbul and to people and places back in the Netherlands, and whether there are any specific “changes” I should/can look at in this context. All in all, the richness of the sessions has given me a great deal to think about regarding the big question of what doing media anthropology means, which has made it a great couple of days. But it has also been eye-opening in terms of what I learned about the political pressures under which scholars using ethnographic methods are subject to in contemporary Turkey.